Full disclosure: I own both the softcover and PDF editions of this game. I have read the book cover to cover , but have not had the chance to play the game as of the writing of this review. The physical quality of the book and card deck is amazing. At first glance the pocket booklet gave me the impression that is was going to be fragile and bend too easily. That appears to not be the case. The card deck is quite solid as the publisher has used high quality thick card stock with a nice semi-gloss coating. Example of a card used in the game. For a long time, we were at war with The Jackals. But now, we’ve driven them off, and we have this – a year of relative peace. One quiet year, with which to build our community up and learn once again how to work together. Come Winter, the Frost Shepherds will arrive and we might not survive beyond that. But we don’t know about that yet. What we know is that right now, in this moment, there is an opportunity to build something. I am not sure that I can elaborate any further on the concept of the game; Joe has done a great summing up his game! 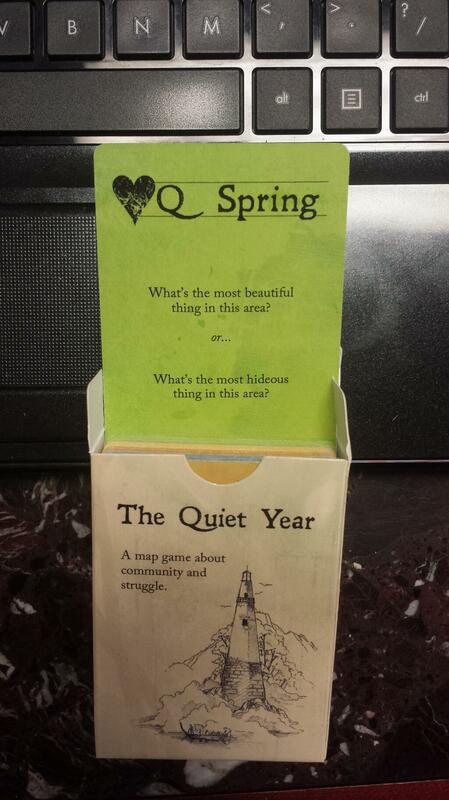 The Quiet Year is played using a rather unique set of rules you won’t find elsewhere in the RPG cosmos. Players assume the role of village elders or in other words, a collective management group of the village or town. It is from that perspective the mechanics of the rules can be framed. The game is played over a maximum of 52 weeks. Each player turn constitute a week and thus a card draw is part of the player turn. The cards are broken into the four seasons of the year for added tension. Before the player turns begin in earnest, the group collectively, in turn, builds a rough map of the village by adding simple and crude representative images to a sheet of paper. This will be the basis of all other decisions throughout the game. Players will also define resources that are in abundance and scarce. This will help to add drama and tension to the game especially when combined with the cards. A player’s turn consists of several phases in a defined order: Draw a card and resolve one of the two events on the card, project dice are reduced by one and lastly choose one of the four available actions to complete. Once these phases are completed play passes to the next player. The genius of this game is in how the cards change the dynamic of the game each player turn. The cards, in sense, set the tone and level of drama of the player’s turn and the action that player performs (potentially driven by the card played) serves as the essence of the turn. Players should take care to remember that they are NOT representing individual members of the village, but instead are working collectively as the elders to help the village survive and try to prepare for the coming shepherds which signal the end of the game. Collectively doesn’t mean absolute harmony among the players. There is a unique mechanic to show your disagreement with another player’s action choice. You’ll have to read the rules to learn more! I would encourage everyone to check out this unique RPG. While it is different from tradition RPGs in that you are not playing a character in the classic sense, you are working together to provide your village with a chance to survive the coming Shepherds. Conceptually the game will challenge your idea of what it means to play an RPG; this will be especially true for those that have not ventured into this genre of the RPG cosmos. The cost of the materials is negligible and hardly a barrier to owning and trying this game. This is one of my “must play” games for 2014! Next Post So You Want to be a Playtester?